Meet your surf instructor, Alex, the best Costa Rica has to offer. 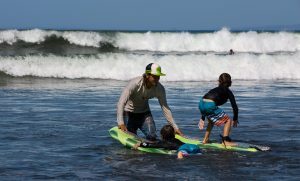 While other surf schools have instructors that teach so they can spend time surfing, our instructors surf so they can spend time teaching our students. It’s all about our students at the Jaco Laguna surf school! Our surf instructors are also life guard trained and certified along with being professional surfers. So rest assured your in the best possible hands with our seasoned professionals. for detailed information regarding surf packages.